The cathedral community of the German city of Xanten said it will return a seventeenth-century painting of a Dutch square attributed to Jan van den Heyden to the heirs of Gottlieb and Mathilde Kraus, who fled Vienna in April 1938 to escape the Nazis. The Kraus family, prominent Jewish members of Viennese society, left behind 160 artworks which were seized and sold to benefit the Nazi regime. 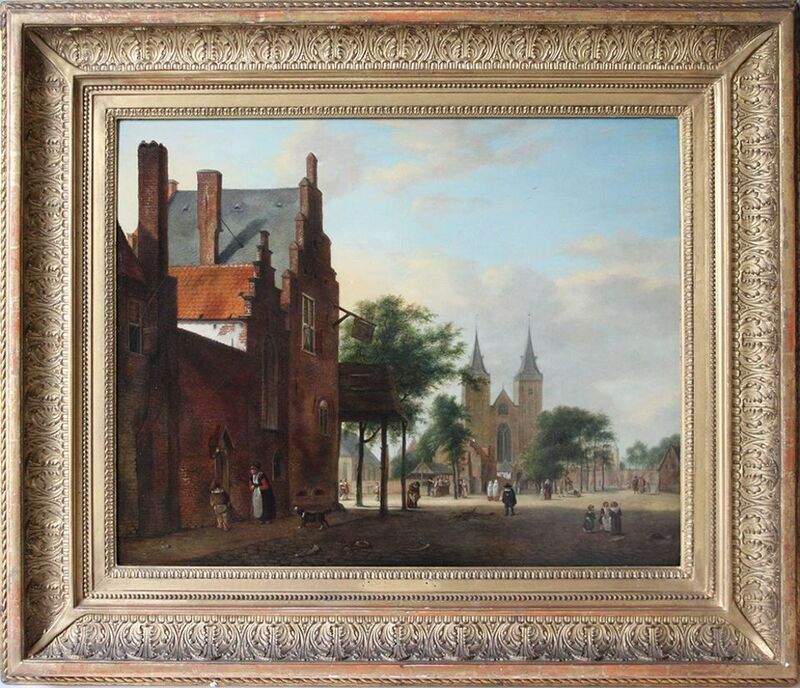 Dutch Square, a tranquil scene showing a twin-towered Gothic church, children playing on cobbles and a little dog watching an old woman at the gate of a gable-roofed house, was among thousands of artworks recovered by Allied troops after the Second World War. An investigation by the London-based Commission for Looted Art in Europe into how the painting entered the possession of the cathedral in Xanten, a small town in the German state of North Rhine-Westphalia, turned up some surprising discoveries. After its seizure, the painting was sold to Heinrich Hoffmann, Adolf Hitler’s friend and photographer. Hoffmann’s collection was confiscated by Allied officers, who entrusted the state of Bavaria with about 10,600 works in total on the understanding that looted art would be returned to the heirs of those who were robbed by the Nazis. Dutch Square was among the works that entered the Bavarian State Paintings Collections. But instead of tracing the Kraus family, the State Paintings Collections returned it, in exchange for just 300 deutschmarks, to Henriette Hoffmann von Schirach, the daughter of Heinrich Hoffmann. “This led to the discovery that many paintings were secretly returned by Bavaria to families of high-ranking Nazis over a period of some 20 years after the war,” the Commission for Looted Art in Europe said in a press release. Among those who benefited from these Bavarian returns were the families of men indicted at the Nuremberg trials—including Reich Youth Leader Baldur von Schirach and Reichsmarschall Hermann Göring. Hoffmann von Schirach sold Dutch Square a few months after recovering it. It was purchased by the Xanten cathedral community at Lempertz auction house in Cologne in 1963. The painting is only the seventh recovered by the Kraus heirs—the other six were returned by Austria in 2002 and 2004.